When your printer breaks down, you want to know how soon it can be fixed and how much it will cost. At Teffont we offer you a choice of 4 or 8 hour response times and most of all provide you with a single fixed price so no matter how much time is required to repair your printer you’ll pay no more – giving you complete piece of mind. Teffont’s fixed price printer repair guarantees that no matter much time is needed to repair your printer you will always pay one price, even if a return visit is required. If your printer requires any parts you can be assured that you will always pay the lowest possible prices. Our buying power and extensive parts stock helps guarantee our competitiveness. Our engineers are experienced, professional and courteous. Arriving within either 4 hours (our premium service) or 8 hours (our standard service) our engineers will quickly and efficiently repair your printer as well as provide a free check-up and clean. If your printer can’t be repaired onsite we will provide you with a loan printer, helping you to continue working as normal while we repair your printer in our workshops. 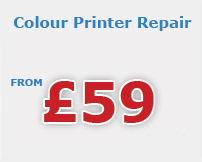 Our freephone number is your direct line to our expert printer repairs team. Call today to see how we can help repair your printer. Choose Teffont today as your ideal printer repair company. 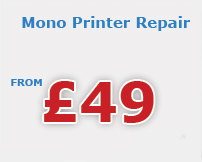 Once you’ve had your printer repaired why not consider taking out an annual maintenance contract? You get all the great features of our printer repair service plus a whole host of other benefits including free parts, training and a helpline. We have engineers trained in repair of Brother, HP, Canon, Konica Minolta, Epson, Lexmark, Ricoh, Samsung, Xerox and Oki.